Either click on the file to play or right click on the file and select save as to save on your computer. 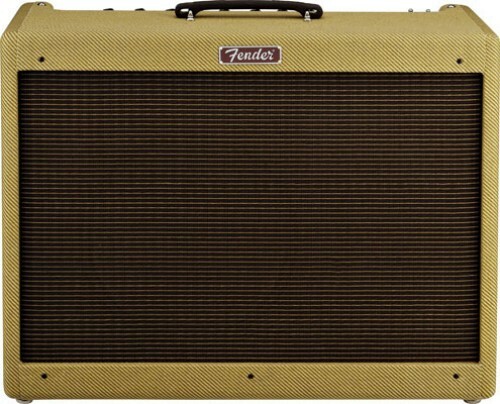 The Fender Blues Deluxe upgrade kit fitted with a Harma STR GT 6L6GC GE and the Harma Dark Sapphire speaker is designed to give you that bright sparkling vintage Fender sound clean sound with an extended bass response. It is designed for the guitarist who demands top quality clean sound with a more depth and bass extension while keeping a warm harmonic crunch to their tone. The Harma ECC83 STR is used in our Fender kits as is the best choice for the sparkling clean sounds that most players want from their Fender amplifiers. The mid-range is very transparent which when changing pickup selection give a nice tonal variation which is lost in some other valves. The valve responds very well to pedals and crunches up without that harsh fuzzy tone. The Groove Tubes 6L6GC-G.E Re issue has the right balance of clarity and distortion when pushed in Fender amplifies. In clean mode, this valve provides a warm smooth sound with a very clean and open treble and is a faithful reproduction of the original General Electric’s tone. In overdriven mode the valve has that clear and crunchy dynamics that produce a clear creamy warm singing sustain. The Harma Dark Sapphire as it’s name suggests has a well extended and tight bottom end, warm midrange with more punch and presence and natural top end. It has all the most requested features that our customers wanted that was not available from any other manufacturer. We have built a speaker which has the right balance of clarity and top end neutrality with the bass extension and midrange presence lacking is so many speakers today. This speaker is simply awesome for Strat players who want bass extension.